This is the fifth of a five-part series presenting 50 dividend growth stocks that I have screened for current fair value. With this article, I will be covering 10 additional dividend growth research candidates with moderate to higher yields in addition to the initial 40 that I presented in part 1 found here , part 2 found here , part 3 found here and part 4 found here. The first 4 parts of this 5-part series presented research candidates ranging from high to moderate yielding attractively valued dividend growth stocks. With this part 5, most of the candidates are more oriented to dividend growth investors seeking a higher total return. To be clear, most of the research candidates in this group might appeal to investors who are still a few or more years away from retirement. Although dividends are still important to this investor type, portfolio and dividend income growth are more pertinent than a high current yield. This is the final article in this 5-part series on not just 50 attractively valued dividend growth stocks, but also a series of insights into the principles of valuation itself. Consequently, a primary focus of this series of articles is on attractive valuation. Regardless of whether you are investing for growth, current income or income growth, valuation is a universal principle that should be applied with discipline and prudence. However, being disciplined to only invest at fair valuation is more about prudence and controlling risk than it is about generating the highest possible return. Nevertheless, I believe all successful investment strategies should start with the primary focus on identifying fair or intrinsic value. Accordingly, I will conclude this series by reposting many of my views on valuation I made in previous articles. Furthermore, I suggest that valuation is a mathematical principle and not a vague concept. Therefore, when I speak of valuation, I am referring to the mathematical calculation of the returns (including both capital appreciation and dividend income) which you could prudently expect to earn from the company’s earnings and/or cash flows. Those returns should be large enough to compensate you more than you could earn from a theoretically riskless investment like a Treasury bond. If you are not being compensated for the extra risk you’re taking by investing in stocks, then I believe you are paying more than you should be. The venerable investor Warren Buffett has a real knack of putting complex concepts and ideas into simple and easily understood terms. In my opinion, his quote, “Price is what you pay. Value is what you get” is one of the more profound and important statements he has ever uttered. If truly understood, these simple words represent perhaps some of the most important bits of investment wisdom that an investor in common stocks could ever receive. The concept of fair valuation represents the key to receiving the full benefit that these wise words provide. Knowing the “price” you pay is simple and straightforward. And, although many have an intuitive understanding of value, its deeper meaning is often only vaguely comprehended. Anyone who has truly made the effort to study Warren Buffett’s investment philosophy understands that receiving value on the money he invests is of high importance to him. So how do you know, when buying a stock, if you’re getting value or not for your money? I contend that the answer lies in the amount of cash flow and/or earnings that the business you purchase can generate on your behalf. And regardless of how much cash flow and/or earnings the business can generate for you, its value to you will be greatly impacted by the valuation you pay to obtain it. If you pay too much you get very little value, but if you pay too little, then the value you receive is greatly increased. Therefore, if value is what you’re looking for, then it’s important that your attention be placed on the potential cash flows and/or earnings that you’re expecting to receive. Unfortunately, few investors possess the presence of mind to focus on this critical element. Instead, investor attention is more commonly and intensely placed on stock price and its movement. A rising stock price is usually considered to be good, and a falling stock price is considered bad. However, prudent investors understand, recognize and acknowledge that the stock market often incorrectly prices the stock behind a business relative to its intrinsic value. Just like the Warren Buffett quote, Peter Lynch’s quote is also based on the principle of sound valuation. The point is that a rising stock may be dangerously overvalued, while a falling stock price may indicate that the company is becoming a rare opportunity on sale. Importantly, this can only be determined by focusing on the company’s fundamentals and the intrinsic value they represent. Knowing the difference between a so-called “value trap” versus an attractive opportunity will materially impact not only the long-term rate of return the investor receives, but perhaps more importantly, the risk they are taking to get it. As I will illustrate later, you can dramatically overpay for even the best company. Because, it is a truism that the stock market can, and often will, inaccurately appraise the value of a business from time to time – up or down. From what has been said so far, it should be clear that to receive value, you must know how to calculate value. Then, and only then, can you be certain that you’re investing in a stock and receiving value for the price you pay. However, there is an important caveat that needs to be introduced. Just because you buy a stock at value doesn’t necessarily mean that you will receive a high return. This is because value, although important, is only one component of future return. Another important component is the earnings and/or cash flow growth rate of the business. To clarify, you can buy a slow-growing company at sound valuation, and even at the same valuation as a faster growing company, while still earning only a modest rate of return. In fact, it could be argued that only being willing to invest at sound valuation is more critical for a slow grower than it is for a faster grower. As an aside, and as it relates to common stocks, this is usually associated with higher yielding slower growers. The rationale here is that there is very little margin for error when investing in a low growth security. Therefore, it’s even more imperative that you get valuation correct. This may be one of the most confusing aspects of fair valuation, or value, that I will elaborate on later. What gives a business (stock) value? Ultimately, any business, public or private, has its value derived from the amount of cash flow and/or earnings it can generate for its stakeholders (stockholders). In the long run, not only will capital appreciation depend on the level of cash flow and/or earnings, dividends and the growth thereof are also a function of these important metrics. It is because of this principle that the discounted cash flow (DCF) method of valuing a business is so widely accepted by scholars and professional investors. Consequently, this series of articles on valuation and on how to value a business is strongly based on utilizing fundamental valuations based on cash flows and/or earnings as the primary method for assessing fair value or True Worth™ as I like to think of it as. However, I intend to spare the reader the tedious task of evaluating or calculating long and complex mathematical formulas to assess fair valuation. Instead, I will focus on presenting logical explanations and straightforward discussions of the principles behind these important valuation methods. Additionally, I will provide what I hope the reader finds as an easy-to-understand video analysis as evidence supporting my points. Anyone who is interested in a more scholarly approach can simply Google: How to value a company using the discounted cash flow method (DCF). I believe investors can possess a practical and useful understanding of the basic principles of fair value. To receive value when you buy a stock, you must be careful that you are only paying a price that represents sound valuation. Fair valuation is only manifest when your investment in a business is supported by a strong foundation of fundamentals. These would include, but are not limited to, strong cash flow and earnings generation supported by a proven business model with prospects for continued growth. Furthermore, the terms “value” and “valuation” though not synonymous, are very closely related. I am going to do my best to illustrate that the investor can only get value when buying a stock if they apply the discipline of sound valuation when they initially invest. In other words, when the price you pay is at a level that equals sound valuation, then good long-term value is what you will receive. As previously suggested, if you overpay, your long-term value will be less, and if you’re fortunate enough to buy on the cheap, your long-term value will be enhanced. Let’s start by looking at sound valuation from the perspective of minimum to maximum levels based on rates of growth. The reader should understand that much of what I will present next represents an overly-simplistic view of valuation. However, I believe that this is the best way to lay a sound foundation of understanding of this important investing principle. There will be subtle calibrations that investors need to apply when making investments in real world situations. On the other hand, the core principle will aptly apply and hold true. Therefore, let’s initially look at how you would value a future stream of income that doesn’t grow (zero growth). A 10-year treasury bond would represent a good proxy to illustrate this principle. The interest rate is fixed and guaranteed, but it does not grow. Common sense and logic would dictate that you would never be able to buy a Treasury bond at one times its interest. In other words, a stream of income has an intrinsic value that is some multiple of its annual income stream. To calculate current valuation, you simply divide the interest rate it pays into its price. With 10-year treasuries yielding approximately 2.95% today, you divide 2.95 (the rate) into 100 (the price) and discover that it is selling at approximately 34 times interest. Stated another way, it would take 34 years of receiving those interest payments to pay back your original investment if the bond did not mature first. Historically, this is a very high price, which means that yields remain historically low. Therefore, people, possibly still traumatized by the Great Recession, are buying Treasury bonds today because they are willing to pay the high price for the safety they perceive they are receiving. Under more normal levels of interest rates, 10-year Treasury bonds have been more typically offered at yields of 6% to 8%. Do the division and this calculates to valuations of approximately 12 to 17 times interest. This also offers a clue to why a P/E ratio of approximately 15 is a general proxy for fair value stock valuations. Nevertheless, any investment has a value that is greater than its annual income stream, but investors should understand there are rational limits to the multiple you pay for an income stream that should not be exceeded. Common stocks are certainly not as safe as Treasury bonds; however, the principles behind sound valuation still apply. In other words, if a company generates an income stream, even if it doesn’t grow, it will have value that is greater than its annual income stream. Otherwise, this no growth investment would be generating cash on cash returns of 100%. Clearly, this would be illogical. Consequently, just like a Treasury bond trades at a multiple of interest, a common stock will trade at a multiple of its income stream. which is generally represented as earnings and/or cash flows. This is commonly expressed as either a P/E ratio or a price/cash flow ratio. The reason I started with looking at a safe, but no growth fixed income vehicle was to establish the minimum foundation of valuation. Historically, the average price earnings ratio that has been applied to the average company (the S&P 500) for the past 200 years has been approximately within a range of 15-17. This calculates to an earnings yield of approximately 6 to 7%. I do not believe it is a coincidence that this also represents the long-term average return that stocks have produced. To keep my promise of keeping it simple, I additionally point out that this valuation calculation also relates to normal fixed income yields of 6% to 8% as discussed above. To summarize and clarify, when you invest in a stock, even a low growth stock, your future capital appreciation will be proportionately related to the growth rate the company achieves in the long run. However, this statement further assumes that you buy a low growth stock at value and measure your performance at a future date when it is also at value. Of course, if you measure it later at a higher valuation, your capital appreciation component of total return will be somewhat higher – and vice versa. 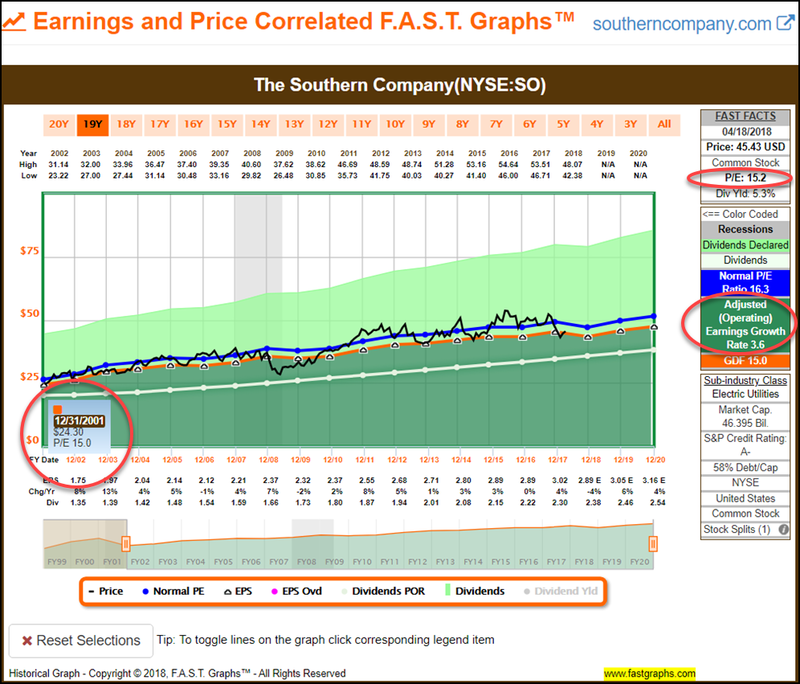 The following utility stock Southern Company (NYSE:SO) provides a real-world example of what I’ve written above. Note from the historical earnings and price correlated FAST Graph that Southern Company’s earnings growth rate was 3.6% over this time frame. Further note that the company was fairly valued at the beginning of the time frame being measured and fairly valued at the end (P/E ratios approximating 15). 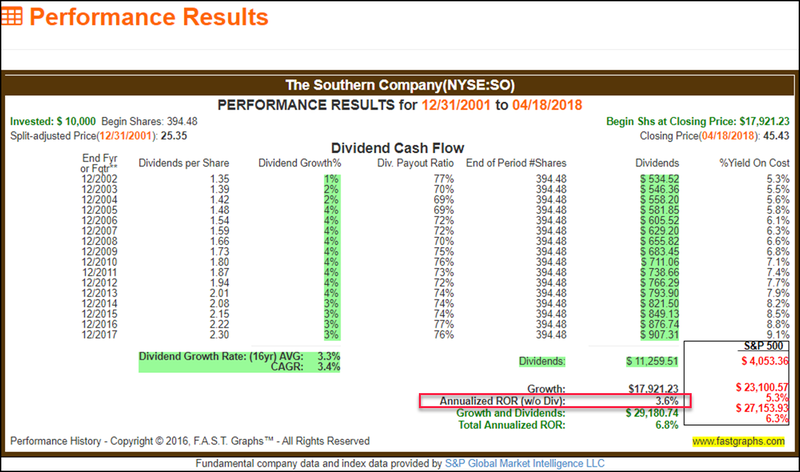 As a result, when we examine Southern Company’s performance over this time frame we discover that capital appreciation (annualized ROR (w/o Div.) was also 3.6% – or precisely equal to Southern Company’s earnings growth rate. The reader should also note that even though Southern Company underperformed the S&P 500 on a capital appreciation basis, it significantly outperformed the S&P 500 on total cumulative dividends paid. Consequently, even though this is an income opportunity, it also marginally outperformed the S&P 500 on a total return basis over this specific time frame as well. Next let’s look at a faster growing example the J.M. 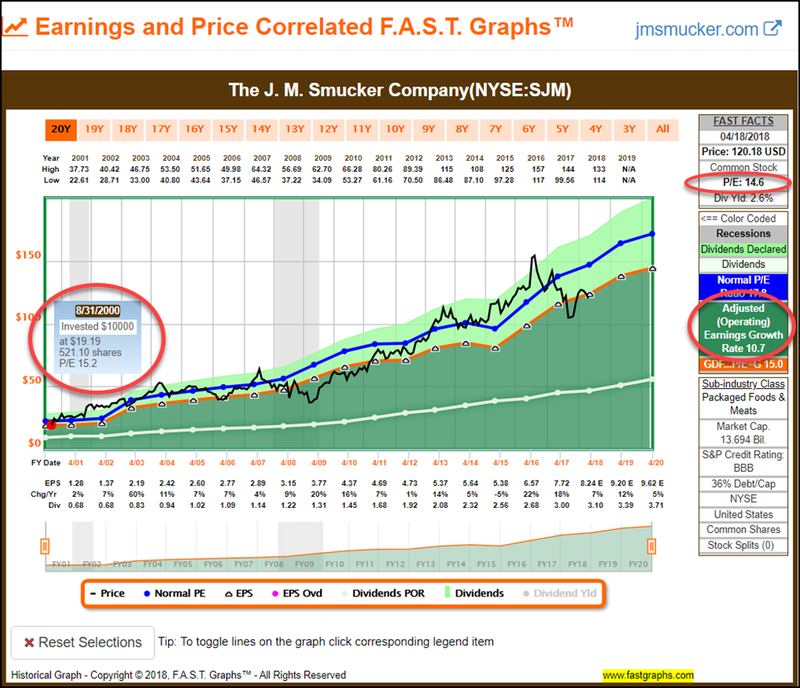 Smucker Company (NYSE:SJM). Here we see another example of fair value reflected as a 15 P/E ratio, however, this company offers a significantly faster earnings growth rate of 10.7% over this time frame. The same fair valuation, however, a dramatically higher rate of growth. Therefore, even though the same valuation multiple applies, the long-term total return will be dramatically different because of the different growth characteristics of this company’s earnings and dividends, etc. Therefore, just as we saw with Southern Company above, the much faster growing J.M. Smucker Company produced capital appreciation (annualized ROR (w/o Div.) that was also in direct alignment with the rate of earnings growth the company achieved. However, because of the higher growth, the capital appreciation component was significantly more. Even more interesting, thanks to its fast growth, J.M. 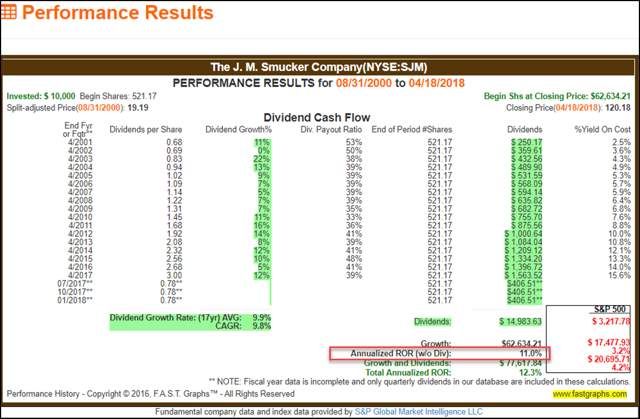 Smucker Company also produced a greater level of total cumulative dividends than the higher-yielding Southern Company did. Thus far I have attempted to lay the foundation of understanding how to value a common stock. So far I have presented low to moderate earnings growth examples. Next I will look at companies that grow earnings at 15% or greater as I investigate the nuances of evaluating this faster growth. Extensive research over many years has led me to conclude that a P/E ratio equal to a company’s earnings growth rate (P/E=EPS growth) is more appropriate for companies that grow at faster rates. This calculation also reflects an ideal PEG ratio of 1. In Chapter 7 of his best-selling book One Up On Wall Street, the renowned investor Peter Lynch identified six general categories of common stocks: slow growers, stalwarts, fast growers, cyclicals, asset plays and turnarounds. This part of this article will focus on the fast grower category. My definition of a fast grower is one that has consistently compounded earnings at 15% per annum or better over extended periods of time (five years or longer). Furthermore, the more consistent the growth has been, the better it fits my definition of a high growth stock. The rationale behind this relates to the magic that compounding brings when growth rates are 15% or greater. This category of fast grower, Peter Lynch referred to as “superstocks” that he contended deserved the most attention from investors. The reason he believed they deserved the most attention, is because these are the stocks that will generate the highest total returns over the long run. Assuming of course you invest in them at fair value. Companies with these attributes are what Peter hunted for when he was seeking his “10 baggers” because he believed these were the most explosive stocks. Centene Corporation (NYSE:CNC) represents an example of a fast-growing company (stock). Earnings growth has averaged 21.9%. 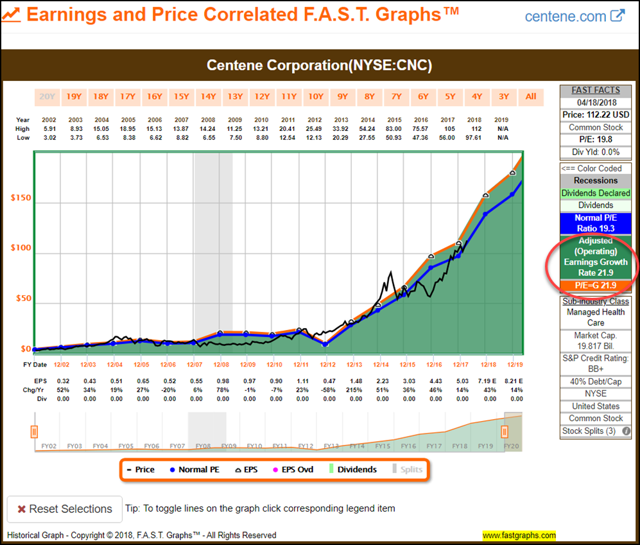 Therefore, consistent with the P/E ratio equal to the company’s earnings growth rate formula, the orange line on the graph represents a fair value P/E ratio of 21.9 for this faster grower. Fair value for this high-growth company is significantly higher than what we saw with our previous examples because of the compounding power of its faster earnings growth. Once again, utilizing this as a valuation reference, we see that stock price (the black line) follows earnings, and we also see periods of time where the stock is undervalued relative to the business results, as well as times when the stock is overvalued relative to the business results. When reviewing the performance results of Centene Corporation we once again see a very high correlation between capital appreciation and the company’s earnings growth achievement. Moreover, a primary difference with this example compared to the others is that there are no dividends. This is a classic example of a growth stock in contrast to a dividend growth stock such as J.M. Smucker Company. When you invest in a true growth stock, your total rate of return comes solely from capital appreciation. As an important aside, this relates to the reasons why many consider growth stocks riskier. For starters, it is very difficult to grow a business at rates above 15% like this company did. Additionally, there are no dividends being paid to soften the blow of short-term volatility that will inevitably occur from time to time. How Do You Account For P/E Ratios Below 15? Anytime you come across a company whose price earnings ratio is less than 15, which I have described as a foundational P/E ratio in this article, it’s usually associated with uncertainty. A current P/E ratio below 15 might possibly imply a concern that future earnings are expected to be less than current levels. In other words, this could mean that you are paying a higher P/E ratio for these expected lower future earnings. For example, let’s assume you buy a dollar’s worth of earnings today and pay $15, or a PE ratio of 15. One year later, the dollar’s worth of earnings you paid $15 for today have fallen to only $.50 worth of earnings. Therefore, you have paid a P/E ratio of 30 for those lower future earnings. Consequently, we might assume that the market may have been acting as a discounting mechanism, or as suggested, just mispricing the company. Other uncertainties that could cause chronic low P/E ratios below the standard P/E ratio of 15 could relate to quality considerations. There are also certain sectors, the energy sector comes to mind, where the market routinely applies a lower valuation. Of course, as previously stated, uncertainty is usually associated with those lower-than-justified valuations. Additionally, a P/E ratio below 15 may just be an example of the market undervaluing the company, as I pointed out earlier in this article. The following portfolio review provides a summary of important metrics for the final 10 of 50 fairly-valued research candidates. The reader should note that the last 2 columns (light brown) provide annualized total return estimates based on the consensus 3 to 5 years trend line analyst estimates of either cash flows or earnings. The first light brown column provides total annual return estimates based on earnings, and the second light brown column provides total annual return estimates based on cash flows. It’s also important that the reader understands that the primary attribute that each of these 10 research candidates have in common is fair valuation. Moreover, each individual candidate will not necessarily be an appropriate investment for every dividend growth investor. I believe it’s vitally important that each investor builds portfolios according to their own unique goals, objectives and risk tolerances. Therefore, I suggest that readers might pick and/or choose to examine only those that meet their own personal needs. I will be elaborating more on this important aspect in the FAST Graphs analyze out loud video to follow. In the following video, I will briefly illustrate why I believe each of these 10 research candidates are currently fairly-valued. Additionally, I will provide commentary on what type of portfolio or dividend growth investor they may be appropriate for. Furthermore, a word of caution relative to recent market volatility is also in order. With the stock market fluctuating as much as it recently has been, valuations and current dividend yields are presently very dynamic. To understand what the intrinsic value or fair value of a common stock is, you must think like a long-term business owner and not like a stock trader. Additionally, you must think like a business owner that has no intention of selling their business. Put another way, your business generates your livelihood. Therefore, your primary focus and attention is on answering the question: how’s business? When you own your own business, you care about sales, cash flows and ultimately net profits. These are the things that make your business valuable to you simply because these are the things that produce your income. In contrast to requiring a long-term focus, value investing often has a dark side relative to the short term. In many cases, a stock comes into fair value because of it becoming temporarily out of favor with investors. Although this is not always true, it is often true during powerful bull markets like we’ve been in since the Great Recession ended. Nevertheless, value investors also need to be fully cognizant of the reality that they do not “ring a bell” at market tops or bottoms. Consequently, an out-of-favor stock that has become fairly valued can continue to drop in the short run until the company comes back into favor. In Part 3 and Part 4, I presented examples in the aerospace and defense industry that reflect this short-term danger. Finally, please remember that as a rule (and there are always exceptions to every rule), investors generally face a trade-off between growth and income. This same principle applies to risk. In theory, investors must be willing to take on greater risk to achieve higher rates of return. These principles speak directly to why investors need to invest according to their own goals, objectives, and risk tolerances. This concludes this five-part series on 50 fairly-valued dividend growth stocks, I hope you found it of value. If you enjoyed this article, scroll up and click on the “Follow” button next to our name to see updates on our future articles in your feed. Disclosure: I am/we are long SO, JCOM, KR, THO.